This post was originally published at Melbourne Polytechnic. Novelist and lecturer Dr Alice Robinson from the Melbourne Polytechnic Bachelor of Writing and Publishing course joined two climate scientists and a lecturer in journalism to discuss the different styles of writing between science and literature in motivating people on the issue of climate change. 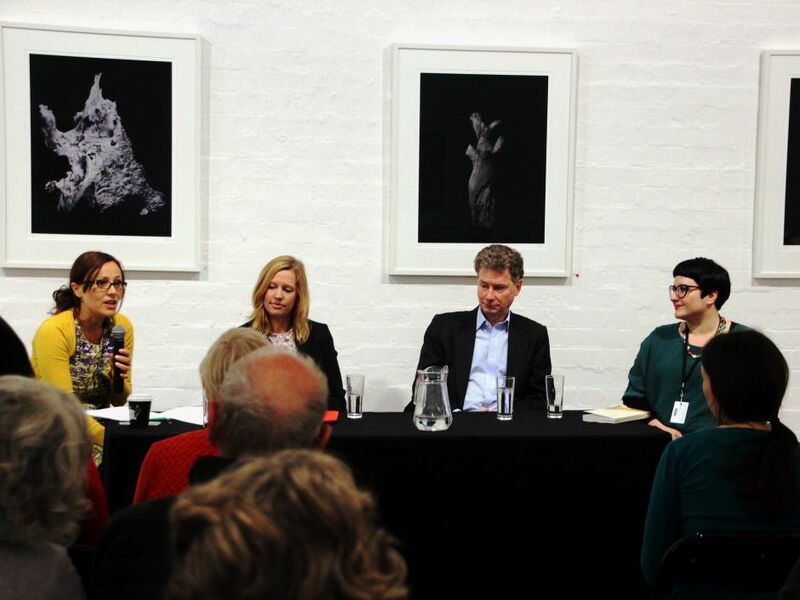 The Melbourne Writers Festival brought together the panel to discuss stories of climate action. The featured panelists were: Monash University Journalism lecturer Deb Anderson, Monash University climate scientist Ailie Gallant, climate scientist Associate Professor Kevin Walsh from Melbourne University, and novelist and Bachelor of Writing and Publishing lecturer Alice Robinson from Melbourne Polytechnic. The event was held at the fortyfivedownstairs Gallery on Friday 21st August, which also featured an exhibition of handwritten letters of 22 climate scientists responding to the question: "How do you feel about climate change"? Scientists talking about their emotions? No, sky isn't falling, it's just the #mwf. Quite the challenge, but let's do this!! Alice Robinson's first novel was published earlier this year by Affirm Press, titled Anchor Point, and examines grief, memory, work and sense of place. The book has been described as one novel in a new genre of 'climate fiction', or 'Cli-Fi'. "I sat down to write my debut novel, Anchor Point, compelled by the reading I had done on climate change, which had more than confirmed my worst fears. As the writing and editing processes dragged on in a way that will be familiar to anyone who has ever published a book (but were shocking to me) I believed in the ability of literature to make change – personal, and even cultural. According to the American postmodernist J Hillis Miller, 'we see the world through the literature we read… We then act in the real world on the basis of that seeing'." The Marshall Islands in the Pacific have expressed interest in developing an OTEC plant to provide power and desalinated water and communicated that interest to the United Nations Framework Convention on Climate Change in the lead up to the Paris 2015 climate talks. Fiction writers can provide a vision of what society may look like given slightly different conditions, or what social and behavioural adaptations may be useful for the future. Science fiction writers have done this, mostly with technology but occasionally with examining changes in social behaviour and social structure envisioning ways we can adapt to the changing environment. We are certainly going to need to adapt on personal and societal levels, even if we do bring our greenhouse gas emissions under control. While scientists can provide projections of what might the future hold based upon current trends and assumptions, fiction writers are able to thoroughly flesh out a realistic vision which can contain elements of both utopia and dystopia. Creative writers can also engage us in connecting such an amorphous issue as climate change to a sense of place, where we can more readily understand and interpret the issue. This connection can provide motivation for acting on climate change, whether through taking small personal changes in behaviour, to lobbying friends and neighbours, or our elected representatives. A Melbourne Writers Festival session I attended the following day at Footscray on climate change and place, also examined how writers can use their skills for motivating change. Whether climate change remains a distant event in time or space, or can be intimately connected to the present and locations we know and love, can make all the difference in how people perceive and act on the issue. 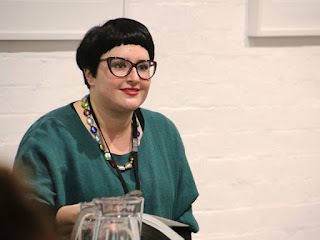 Alice Robinson asks similar questions in her Wheeler Centre guest post, "can these narratives work actively to prevent climate change, as I so fervently hoped when I first began writing my own novel? If our culture acts in the world on the basis of what we glean from texts, as Hillis Miller proposes, then can certain narratives lead us toward a different, better, safer way of living? Can a genre prevent us from destroying our home?" She answers in the same essay, "Heartbreakingly, to my mind, the answer is no." While pessimistic that climate fiction can save us, Robinson also articulates that the danger is also mercifully uncertain. She draws upon the measure of hope that parenting provides "My novel comes to an end in the last gasp prior to any definitive apocalypse, allowing for modest hopefulness, my small concession to the idea that the future may be other than what I fear it will be; that my precious children, and their children, may yet remain safe." "There is comfort in the knowledge that while scientists might attempt to model the scale of disaster, at present only fiction can imagine what our futures might look like, how humanity might respond." says Robinson. "I wish that climate change were not real. "This seems like a strange thing for a climate scientist to say, but it's true. "If climate change were not real, we would not have to be concerned about it. We wouldn't have to worry about the future of our water resources, already strained by over population. We wouldn't have to worry about sea level rise increasing the flooding of our coastal cities and of low-lying, densely-populated areas of poor countries. Above all, we wouldn't have to worry about climate change being yet another source of conflict in an already tense world. "Life would be so much simpler if climate change didn't exist. But as scientists, we don't have the luxury of pretending." Alice Robinson also identified the importance of literature in capturing and preserving cultural ideas and perceptions for the future and future generations in her post at Artshub. "If nothing else, our ability to preserve cultural ideas and perceptions about our lands, futures and prospects for survival, through publication, lends us a certain power during what feels like a hopelessly powerless time." "Writing and publishing, as well as other cultural records, like film, afford us the opportunity to send a message through the years. Even if cli-fi can’t save us from ourselves, there is a measure of comfort in the notion that future generations will read the texts we are producing now. My hope is that, in doing so, they will come to understand that the perilous realities they are grappling with were already troubling to us. A tragedy we could imagine, if not avoid, long before it came to pass." said Robinson in the Artshub article Can cli-fi save us from ourselves? "And sure enough that ticked something off in my brain. I would wander round the suburbs of Melbourne and look up and there were all these solar panels I didn't know were there. "I think that things are actually happening. Things are changing. We won't quite realise how much things have changed until we get there. With windfarms or whatever we are talking about....I feel like there is a bit of momentum at the moment, perhaps not helped by the current Government. ... My research is in climate extremes: drought, extreme heat, things like that. There is not that many good stories about that." "I feel that my work perhaps is more situated in exploring the worst case scenario. I feel like that is something I can do as a fiction writer, and that might be a powerful contribution in the sense that it is a place I can go where these guys [climate scientists] can't go, or can only go to offer solutions, whereas I can offer up a vision." One of the interesting recent texts, not discussed by the Climate Scientists and Robinson, but raised by journalist Michael Green at the Footscray discussion on climate change and place, was Naomi Oreskes and Erik Conway's 2014 book, The Collapse of Western Civilisation. This tale is written from the point of view of a Chinese historian from the Second Peoples Republic over 300 years in the future looking back and assessing and asking why we didn't act with any sense of urgency when we new the risks involved. The book details on page 33 "The human populations of Australia and Africa, of course, were wiped out." A stark reminder of one possible future for us here in Australia. Although it is fiction, the science and historical facts it is based upon up to the present is rigorous. Both authors have backgrounds in science and are respected historians of science, that have turned to fiction to highlight the scale of the problem. The exhibition in the same space underlined the importance of communication and narrative elicited by the four panelists. The letters in the 'Is This How You Feel?' 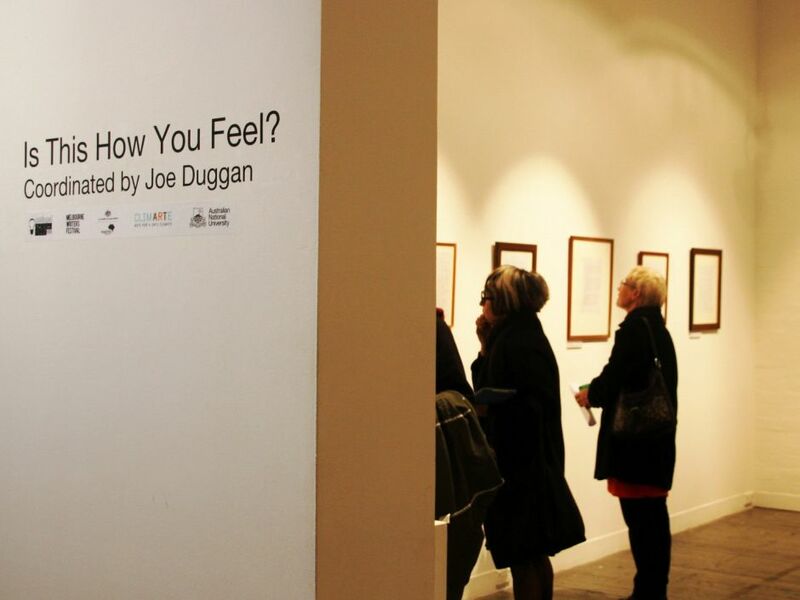 exhibition, curated and co-ordinated by Joe Duggan, vary from person to person, but in each we see an element of personal emotion on the issue of climate change from the people who spend their lives meticulously analysing and examining the scientific data. The letters communicate a sense of the urgency and necessity for action to address climate change. All the letters are available to view in their handwritten and plain text form online at Joe Duggan's website: Is this How You Feel? Novelist and creative writer Dr Alice Robinson is a lecturer in the Creative Arts Department for the Bachelor of Writing and Publishing course.